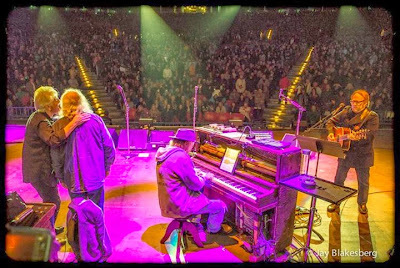 The Photo of the Moment is Crosby, Stills, Nash & Young last night at the Bridge School Benefit concert (10.26.13) by Jay Blakesberg. Definitely the best seat in the house for this shot during "Singer Without A Song". Incidentally, performed for first time without Crazy Horse. More highlights from 2013 Bridge School Benefit Concert Webcast and re-broadcast/re-stream info. Great pic... set list sounds amazing. . I will have to try catch up with this sometime very soon.... hope they all had fun and made loads of cash for this great great cause. .
believe he did singer without a song on le noise tour without crazy horse and war of man with heart was ommited from setlist . great show great cause thought csny was totally on very nice indeed. A tribute to a great songwriter and poet by Neil Young and My Morning Jacket on Sunday. And of course Lou Reed was a bridge school artist. Here's a HD version of Sweet Nuthin'. Neil Young, Elvis Costello, My Morning Jacket, Jenny Lewis & others performing "Oh! Sweet Nuthin'" in tribute to Lou Reed. October 27, 2013. Shoreline Ampitheatre, Mountain View, California. Were they making that sound? "There are only a few who go through with their purpose and accomplish things. Whatever work it may be, the way to success is, after all, to stick to one's intentions to the very last. Everyone is able to do it; it depends only on one's will."